Our Jet Ski tours are exciting and offer a wide variety of scenery and intensity. We have tours of Jamaica Bay, NYC Harbor, City Island, Jones Beach, Whale Watching and private tours. Tours range from 1 hour to multiple days and are led by expert Jet Ski guides that are knowledgeable with the waterways and help you get the most out of your experience. Call us for more information or Click Here to book an activity right here on our website. The Rockaways are making a big splash with New Yorkers and tourists from around the world. 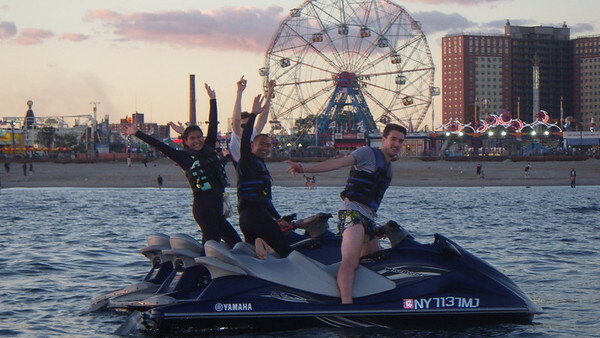 Rockaway Jet Ski is bringing the next wave of summer time excitement your way. Gather your friends and come visit us under the Cross Bay Bridge to find out more and rent your Jet Skis today! Dry off at the Thai Rock Deck and Bar and stick around for the finest live entertainment New York has to offer.